So, if you haven't seen them already, I recently shared the first two posts about my recent trip to Ireland, featuring a few days in Dublin, and a day trip to Blarney. 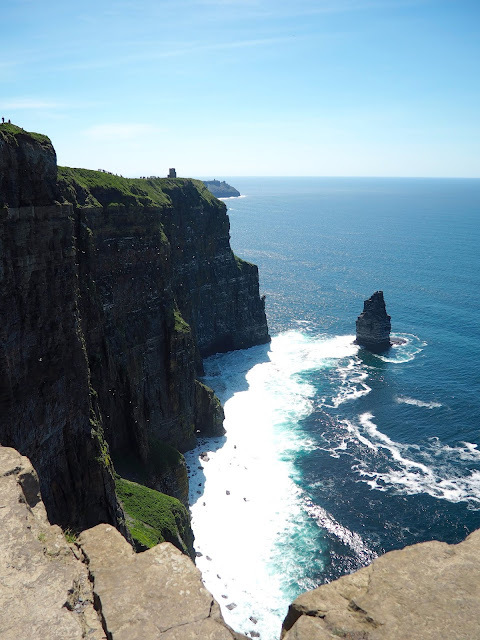 This is the third and final instalment of the trip, featuring the other day trip I did, to the Cliffs of Moher. I used the same company as I did for Blarney (Paddywagon), and was overall pleased with the quality of service on both days, even though it did still feel a bit too tourist-y at times. Some of the commentary on the second day overlapped with the first, about Irish history, but I understand why they all do that, as many people will only go on one trip with them. I still listened, as some people offer up different details on the same stories, so I wasn't bored! 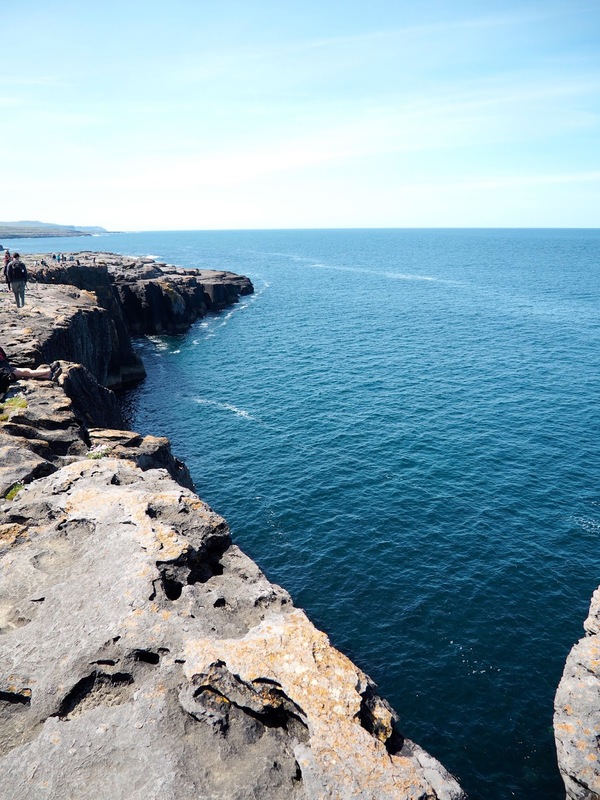 It was also a fantastically sunny day, which was perfect for a trip mainly focussed on enjoying the views of the coast and Ireland's natural scenery! One of the things I really liked about this trip was that our stops on the way to and from the Cliffs weren't just service stations, they were almost sights themselves. 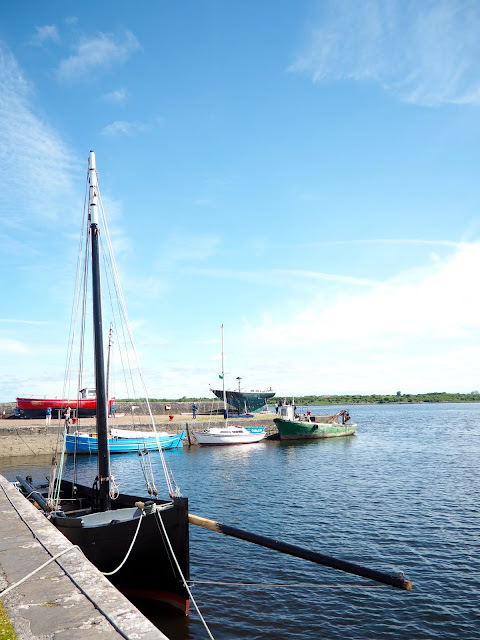 The journey took us all the way across Ireland, to the west coast, and aside from one brief service stop, our first main destination was a small coastal fishing village, called Kinvara, in County Galway. 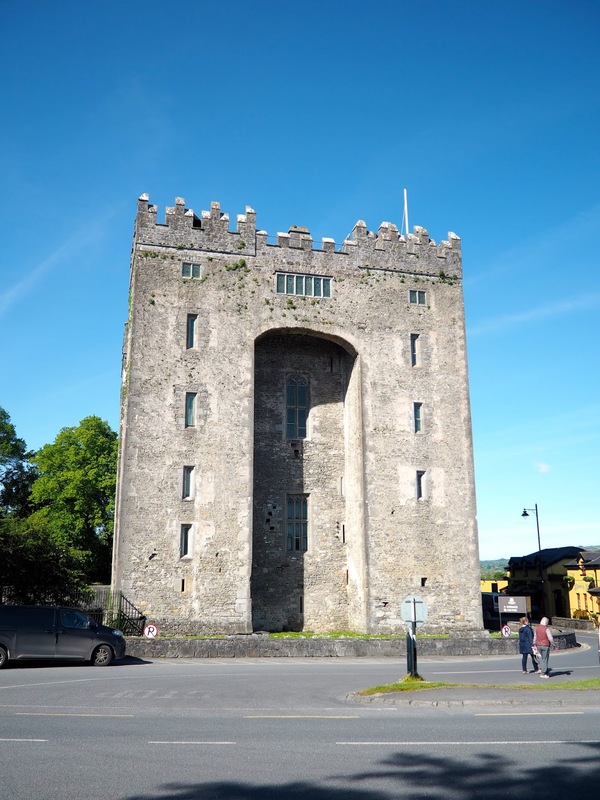 As we drove in, we passed a tower style castle, similar to many found all over Ireland, where some other coaches had stopped off. We drove into the village itself though, so we could access the amenities there, and we could still admire the tower, as it forms part of the landscape visible from the harbour. Kinvara is famous for its fishing boats, known as 'Galway Hookers' - yes, of course, the driver made a joke about them! We had about half an hour in the village, as it's pretty tiny, just enough time to admire and take photos of the views around the harbour - made even better by the weather! - and use the facilities, before hopping back on the bus. We then drove through an area of Ireland known as 'The Burren'. Our journey along the coast followed the Wild Atlantic Way, a driving route all the way down Ireland's west coast, but of course, we only did a small portion of it. The Burren is an area primarily in County Clare, of rocky limestone land, which is of particular environmental interest as Arctic plants are able to grow here, but nowhere else in Ireland, along with a vast array of other flora and fauna, including rare Irish species not found in many other parts of the country. The scenery is beautiful to drive through, both for the coastal and inland facing views. We stopped off at an area often referred to as the 'mini cliffs' in Galway Bay, which are fairly large but nowhere near as big as the Cliffs of Moher, where we had about half an hour to wander over the cliffs, or climb up inland on the other side of the road, for views looking out over the whole area. This was just a taster of what was to come later, but it's still pretty impressive itself. At this time of year, there are also dozens of flowers bursting out of cracks in the rocks. We then continued on to the town of Doolin, for our lunch break. This is a sleepy, rural village, but thrives from the passing tourist trade. It's actually famous for its traditional Irish music scene, and performers come from all over to play in the pubs here at night, but we weren't able to experience this side of the village, being there in the middle of the day. In summer, there are several lunch options to choose from, but many of them close throughout the rest of the year, in the low season, so we only had the option of one pub and one cafe. It was impressive how quickly they managed to serve people though, the average wait time being around 15 minutes, which is good considering there were about 4 coaches worth there! I opted for the cafe, not really fancying the large, hot carvery option in the pub (I don't tend to eat big meals at that time of the day), though I'm sure it would be delicious. We then ran into a spot of bother, when our coach refused to start again! We waited a while as the driver tried to fix it, but in the end the other Paddywagon coach that was also doing the same trip came back after dropping their passengers at the Cliffs of Moher (just 15 minutes away) and took us there. Fortunately, our coach was fixed and able to pick us up again from the Cliffs, after our hour and a half there was up! The Cliffs of Moher was obviously the main destination of the day, and certainly didn't disappoint. It's a spectacular cliff top walk, with a new scene unfolding as you pass over each one. You can spend several hours on them, with the path leading all the way back to Doolin in one direction, but in the time we had, most of us stayed around the central area. You can walk either north or south from the start - I went north first, for about 25 minutes then doubled back, then explore the south path for about 10-15, before doubling back. The central area is part of the visitor centre, with plenty of safety barriers, but the path goes on well beyond that (as there are warning signs advising caution when you venture out of that area!). These areas have a main route tucked behind a wall for safety, but most people walk along the other side of it anyway, along a very well trodden path, as the wall obstructs the views and your photos. I'm scared of heights, so I was definitely not going too close to the edge, but even the exposed side of the wall was far enough back, especially on the north side (I was more nervous going along the south). I was especially delighted with how good the weather was, as we were told that on some days there's too much fog and completely covers all the cliffs, ruining the whole view. It was beautiful for this trip though, allowing for some great photos from the various viewpoints. Even though you're just looking at cliffs all the time, there's so many different angles, and they're so spectacular, that I didn't get bored at all and the hour and a half flew by! We even stumbled upon a couple getting married on top of the cliffs - stunning scenery of course, but I wouldn't fancy having all those tourists watching my wedding? There's a visitor centre too, built into the hillside just behind the cliffs, which was information about the geology and wildlife there, but I actually ran out of time for that, as I was wandering the paths, and only popped in quickly to grab a coffee on my way back to the bus! Our journey then turned inland again, heading back east to Dublin. There was one more stop on the way back though, and again, rather than a service station, we stopped at Bunratty Castle, another of these tower style keeps all over the country. Bunratty is open to visitors, but this wasn't included in our tour price (entry to the Cliffs was), as you need a couple of hours to visit it properly, and we were only stopping for around half an hour. We could view the exterior though, and take some photos, and there was also a pub, cafe, and a Blarney Woollen Mills outlet, for anyone looking for souvenirs. I wasn't really in need of food or souvenirs, and it didn't take long to have a look at the castle, so I didn't really need a whole half hour there, but I sat out and enjoyed the sun for a bit, and stretched my legs, before getting back on the bus for the final leg back to Dublin. The weather absolutely made this trip one of my favourite days in Ireland. Natural landscapes and environments are often some of my favourite sorts of trips and experiences, seeing just how beautiful and splendid the world can be. Obviously not everyone will get such good weather for this trip, but I would have been very disappointed if the cliffs had been hidden by fog and rain, so it really made the whole day even better to have the sun out. Even the driver kept raving about what a good day we had for the trip! So I was very glad to have chosen it for that day, and pleased to have spent some time outside of Dublin, and seen a few other parts of Ireland, in the few days I had there.